Mass is sometimes said in the oratory, located on Nora Hawkes property. 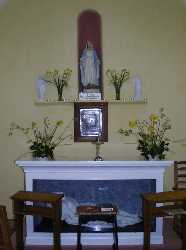 The previous owner, Martin Haverty, built the oratory in 1854, with permission from the Bishop, to commemorate the Immaculate Conception of Our Blessed Lady being made into an article of faith. 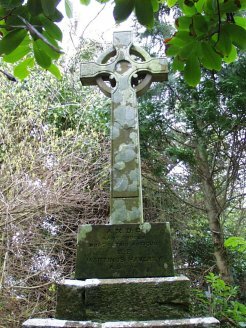 To the right hand side of the oratory is a cross, also erected by Martin Haverty in 1854. John Hogan, a sculptor, made the trial cast of the Dead Christ, which is in the altar of the oratory. The full size version of this sculpture is in St Theresa's church, off Grafton Street in Dublin.